If football's not your thing, South Africa's wellness facilities are world class too. Situated on the 19th floor, the 1,100m2 spa at the The Westin Grand Cape Town offers a bird's eye view of Cape Town and Table Bay and 18 treatment rooms, as well as a specialised hydro-capsule room, pedicure room, sauna, steam bath, heated indoor lap pool, Jacuzzi and a fitness centre. The 483-room hotel is located at the entrance of the Victoria & Alfred Waterfront and is integrated with the Cape Town ICC. Located in the Magaliesburg Mountains, an hour's drive from Johannesburg, the spa at Mount Grace Country House & Spa doubled the size of its facility in May, adding 13 treatment rooms, a pedicure lounge and spa suite with a shower, a hydro bath, gym with iPod stations, steam room and pool. The menu now features more than 15 facials, and body wraps. The hydrotherapy garden offers hot and cold pools and waterfalls. 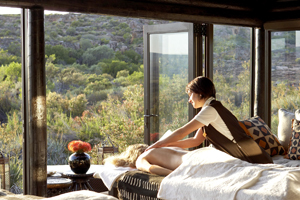 Previously known simply as Bushmans Kloof, the Relais & Chateaux Bushmans Kloof Wilderness & Wellness Retreat has expanded its spa and treatments along with its name. It now offers six treatment rooms and a steam room. Treatments can also be taken in guestrooms or in a secluded rock shelter. The property is set in a malaria- and predator-free sanctuary 160 miles from Cape Town, with over 130 Bushman rock art sites. Along with spa treatments, activities include bird-watching, nature hikes, archery, mountain-biking, canoeing and fly-fishing. The Amani Spa at Earth Lodge, which opened in June, is ideal for post-safari relaxation. The treatments use the Africology product range of natural essential oils blended with therapeutic extracts from indigenous plants. The spa features three treatment rooms, a Jacuzzi, Zen garden and outdoor shower. As with the 13-room lodge itself, suites are sculpted into the earth and use natural fabrics and textures. The Pango Room, a suite for cleansing thermal mud treatments, is designed to resemble a warm cave. The 318-room Crowne Plaza Johannesburg - The Rosebank's Seven Colours Day Spa claims to be the first of its kind in South Africa, promising tailored treatments designed to rebalance the 'chakra'. The treatments include use of colours, fragrances and music to influence wellbeing. Delegates undertake a consultation on their first visit before an individual programme of colour treatments is created for them. Options include the Colour Treatments, focusing on one 'chakra' at a time or the Signature Treatments, offering a series of massages. The spa has seven treatment rooms, a hydrotherapy room, reflexology pool and two steam rooms. South Africa's wellbeing offer is in rude health, and recent investments will provide options for delegates wishing to relax during - or avoid - the World Cup. On the Western Cape, Pezula Resort Hotel & Spa's Pezula Spa in Knysna launched a medi-spa facility in January, with a menu of specialist treatments. Treatments include alpha hydroxy acid peels, botox and non-surgical face-lift threading. Hotel Missoni Cape Town is set to open in October 2010 with 157 rooms. Along with a spa, the property will offer a Missoni Cucina eaterie, bar, rooftop terrace with a pool and views of Table Mountain, as well as meeting facilities. Shelley Point Hotel, Country Club and Spa has opened 90 minutes from Cape Town, and offers 44 rooms, meeting spaces, a pool, lounge, restaurant and meeting space for up to 80. The spa offers a Jacuzzi, sauna, indoor pool and sensation shower. Further north, the Euphoria Golf Estate and Hydro in Waterberg, Limpopo, opened its Hydro Villa spa in May. It offers four private villas with hydrotherapy facilities, including a sauna, steam room, rain showers, Jacuzzi, fan showers and a flotation pool. Meanwhile, on the Eastern Cape, Shamwari Townhouse's wellness facility, Rock Retreat, opened in Port Elizabeth last year. Located on the south-east coast, the boutique property is flanked by unspoiled beaches and malaria-free nature reserves including Shamwari. It offers a selection of Pevonia Botanica facials, massages, body wraps and specialised body care treatments, two treatment rooms, steam room, an Art Deco designer shower and outdoor relaxation facilities.